They are painful, and that’s why so many people are leaving this state. The question I have is, how in the heck can Illinois Republicans continue to fail to make this issue front and center? When 25 percent of the state budget is paying for retired government employees, you would think at least elected conservatives would come up with a plan. Since 1996, total property tax extensions in Illinois have increased 52 percent after adjusting for inflation. This increase took Illinoisans’ property tax burden from around the national average to among the highest of any state. Over 6,000 local taxing districts are responsible for raising these property tax levies, including school districts, special districts, municipalities (cities, towns and villages), and park districts. Families across Illinois have felt the pain of these increases. 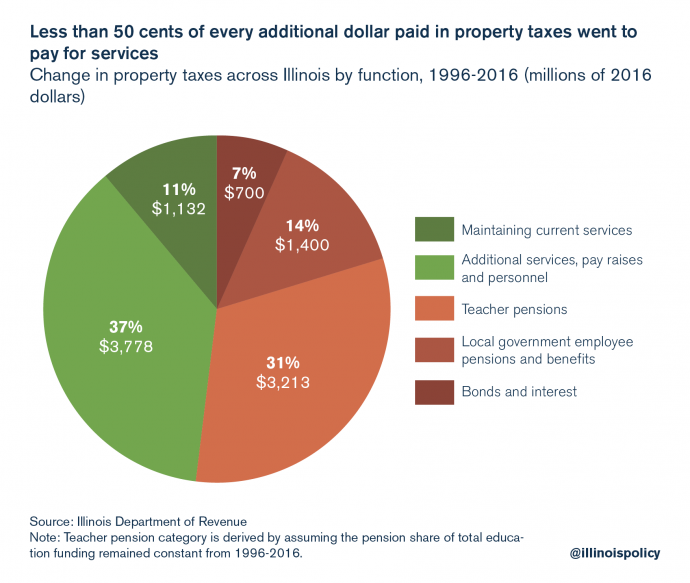 But what many Illinoisans may not realize is that much of the rise in their property taxes can be attributed to spending on government-worker pensions far outpacing spending on state and local services. Traditionally, residents expect property taxes to fund services that improve neighborhoods and raise home values. Instead, this report finds that less than half of every additional dollar levied in property taxes since 1996 went to the delivery of services that improve home values. Analyzing the rise in Illinois education spending is crucial when examining Illinois property taxes, because some politicians claim a lack of state spending is to blame for why homeowners see such high property taxes. Without context, this claim is misleading. State funding for schools does explain much of residents’ high property tax burden, but the key question to consider is: Where is that money going?